When the miners finally drilled and blasted through the miles-high western mountains, they found a strange land filled gigantic animals the likes of which had never been seen in the east except in legend. Vast plains, dense forests, towering mountains, deep swamps, and an interior sea overflowed with deadly predators and immense herbivores. But man (and raptor) is nothing if not adaptable, and those seeking profit, adventure, and the unknown flocked to this land to settle, mine, farm, and explore. The land, now known as Laramidia, holds not only fantastic reptile and bird-like animals, but the ruins of ancient cities, abandoned thousands, if not millions of years ago. The artifacts of this vanished civilization show that the inhabitants were snake-like men. Some of their technology remains functional. And maybe they're not completely gone after all. ...So that's the pitch. 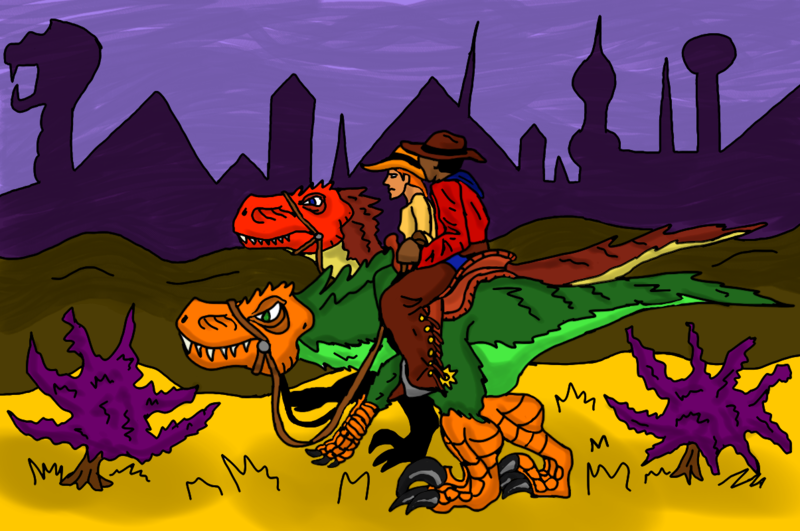 This blog is where I'll tinker with the rules and setting of Riders of the Purple Lotus, my weird-west, dinosaur-centric setting. I've been posting a lot of stuff on Google+, and thought it was time to get into a blog. I'll also be posting about any geeky thing that strikes my fancy, but even if it's not RotPL related, expect dinosaurs.